Bromeliads are one of the most common houseplants. Bromeliad plants are low-maintenance and enjoy the same basic environmental conditions in most homes. These flowering perennial plants bloom in vibrantly-colored inflorescences and reach a width of up to 3 feet. Because bromeliad plants have slow-growing roots, repotting is usually necessary only every two or three years, and they can be kept in smaller planter pots. Bromeliads are easy to care for and can adapt to most indoor environments. Water your bromeliad plants once or twice each week to keep the soil evenly moistened. Don’t allow the leaves dry out, but you can allow the potting soil to dry out slightly between waterings. Provide bright indirect or filtered sunlight for your bromeliads, and place them in an area that has good air circulation. Maintain air temperatures around your bromeliad plants of 70 to 75 degrees Fahrenheit in the daytime and 60 to 65 degrees at night. Keep humidity levels up around your indoor bromeliads, especially during the drier winter months. Place a drainage dish filled with 2 to 3 inches of gravel and water beneath the bromeliad’s planter pot. Ensure that the bottom of the pot is resting on the gravel and not sitting in the water. Repot your bromeliad plants when their roots fill the planter pot. Pot the bromeliads in containers that are at least 2 inches wider and deeper, planting the bromeliads in a lightweight, porous potting mixture of equal parts peat moss, bark and coarse sand. 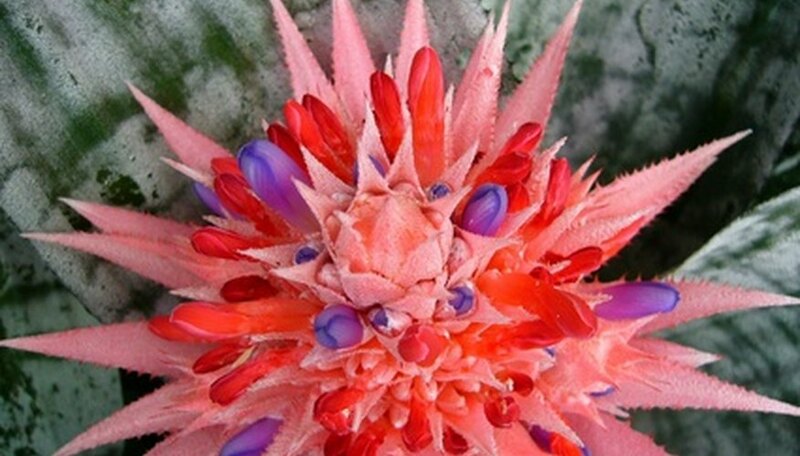 You don't necessarily need to fertilize your bromeliads. If you would like to feed your bromeliad plants, you can apply an all-purpose houseplant fertilizer once every month or two during the bromeliads' active growing season at half the recommended dosage. Don't water your bromeliads with a metal watering can. The metal is toxic to your bromeliad plants and can kill them.